Glueless wigs are made to give the illusion that the hair is naturally growing from the scalp just like the lace wig without the need for glue or adhesive. Each 100% human hair strand is tied onto the lace cap to give a natural, realistic look and feel. The perimeter of the unit is constructed with a stretch type of material to keep the unit in place. Our glueless wigs come with an adjustable strap in back for a flexible fit. Glueless wigs can be custom ordered for that perfect fit or purchased in stock as a one size fits all option. How are lace wigs applied? What is a glueless wig? Stock items are shipped typically, within 24 hours. Custom units are labor intensive and take approximately 40-60 hours to complete, and a total of 4-5 weeks for delivery. The cost of shipment is included during check out. You have several options to choose from. It all depends on the maintenance and care. If cared for and maintained properly it can last from months to years. Baby hair is the short hairs around the perimeter of your head. It can be selected as an option when customizing a lace wig. Typically our stock units come with baby hair. Baby hair can be used to cover up flaws with application. What type of hair do you offer? We offer Indian, Chinese, Malaysian, Mongolian and European 100% Remy hair, which comes naturally straight, wavy and/or curly. We also offer processed hair textures as an option . 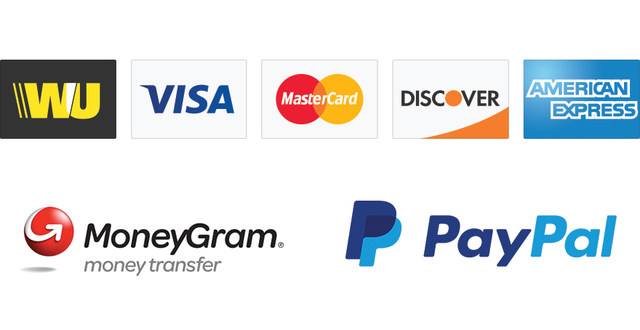 We accept Certified Check, Cash, MasterCard, Visa, Bank Debit Card, PayPal, Discover, American Express, Money Gram and Western Union. What else do I need when I order my lace wig? Our online store has everything you need to get started. We carry quality hair care products and starter kits for your convenience. What’s the difference between French and Swiss Lace? The base caps of our units are typically made with a durable Swiss lace. Rarely do our stock units come with French lace. French lace is known to be the most durable lace but more detectable. We are now constructing our stock units with a new Swiss lace that is as durable as the French lace and far less detectable. Can anyone wear a Lace Wig? Absolutely! People chose to wear lace wigs for different reasons. Some customers wear lace wigs to give their own hair a break, while others choose lace wigs for versatility. Women and children that have medical hair loss such as, alopecia or undergoing chemotherapy treatment also choose to wear lace wigs. They are natural looking, comfortable and light weight. Women of all ethnicities are choosing lace wigs as an alternate hair solution. Will the adhesives damage my hairline? Excellent question....The adhesives will not damage your hairline when applied and removed correctly. Damage of the hairline can be caused by pulling on the lace without properly releasing the bond. How do I measure for length? When determining the length for your wig, be sure to measure from the crown of your head to the desired location where you want the hair to fall. Our wig lengths come in increments of 2 inches. Example: 10 inches, 12 inches, 14 inches etc. Can I dye/color my lace wig? Absolutely, however if you decide to color your unit, we suggest you contact a licensed cosmetologist to do the coloring for you. If you plan on doing multiple chemical processes we recommend you consider virgin unprocessed hair for your unit. Before applying my lace wig, what do I do with my own hair? Braid, wrap, or cornrow your own hair. A wig cap can also be worn. The goal is to get your hair as flat as possible to prepare for the application process. Hair density is the thickness of hair. Our stock units typically come with light density around perimeter to medium density throughout. This gives a more natural look. However, if ordering a custom, premium or medical unit you can choose a lighter or heavier density. I work out regularly and sweat heavy, is a lace unit right for me? Yes, however you will have to experiment with the different adhesives to determine which is best for you and your body chemistry. We suggest the combination of bonding tape and adhesive for a secure, firm bond. We also recommend wearing a headband or scarf around your perimeter while working out for extra security. How do I get the lace off without damaging the wig? Very carefully, make sure you use the correct solvents to remove the unit. Take your time and do not pull on the lace to remove it. After applying solvent to hairline, rub it in and allow time for it to work. Make sure you completely release the bond from the perimeter before attempting to remove the unit. Visit our online store for quality lace wig products. Its important to use the proper hair care products. We carry the Nearly Natural line formulated just for cut hair. Also, when not wearing your unit, wash it and store it. With your lace wig purchase we include care instructions for you. Sorry, but we do not offer a lay-a-way plan. Stock units are shipped typically, within 24 hours. Full payment is due at the time of purchase. When placing a custom order you have two options. Option 1: Pay for the unit in full. Option 2: Pay a deposit of half when order is placed, then pay balance before shipment. (See cancellation info. regarding deposits). What if I get adhesive in my hair? Spray or apply solvent on areas where adhesive is located. Wait a few minutes for it to work. With a fine tooth comb gently comb out residue. What does it mean when a wig is described as being hand-tied? Hand-tied is when the hair tied into the cap or weft is knotted by hand.